Born at Salisbury, England on 20 September 1877, he attended Bishop Wordsworth’s School there. He emigrated to Canada in March 1893 at the age of 15. He took up a farm in the Rural Municipality of Glenwood, starting with 160 acres and eventually ending up with 1,000 acres, which he sold after returning to live in England. His military career began when he joined the Souris unit of the 12th Manitoba Dragoons, in 1897. After service in the Boer War in South Africa (1899-1900), during which he received a leg wound, he joined the Canadian military contingent for the coronation of Edward VII in 1902. He was a member of the North West Mounted Police from 1902 to 1907. He rose to command of ‘B’ squadron of the 12th Manitoba Dragoons. During the First World War, he was a member of the First Canadian Mounted Rifles (1914-1919). He fought at Passchendaele, Vimy Ridge (DSO), Hangard, and The Pursuit to Mons, and in 1916 was injured by shrapnel at Hooge. 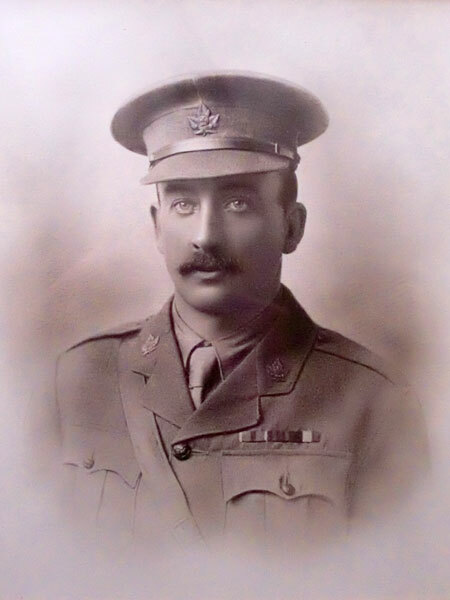 In 1919 he was promoted Lieutenant-Colonel and was at the Saskatchewan Regimental Depot, Bramshott and the HQ Overseas Military Forces of Canada in London. He returned to Salisbury in 1920, where he ran a garage, and had four children: Joan Maxfield (1919-2005), John Maxfield (1922-1996), Peter Maxfield (1924-1973), and Sonia Maxfield (b 1935). During the Second World War, he served with the Local Defence Volunteers in 1940 and the Mobile Column of the 7th Wiltshire Home Guard until 1943. He died on 13 April 1964. We thank Peter Maxfield Jr. for providing additional used here.